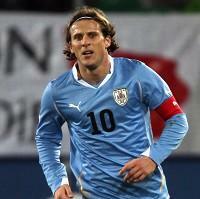 Uruguay's Diego Forlan has won the FIFA Golden Ball as the outstanding player at the World Cup. The Atletico Madrid man scored five goals, including a couple of stunners against Ghana and Germany, as Uruguay exceeded expectations to reach the semi-finals and then lose the third-place play-off 3-2 to Germany. Forlan finished in a four-way tie with Thomas Muller, Wesley Sneijder and David Villa for the Golden Boot with five goals - an award Muller took on a tie-break thanks to having more assists. Muller also picked up the Best Young Player award, while Spain captain Iker Casillas can add the Golden Glove award to his World Cup winners' medal.